Spring semester holidays include MLK, Jr. Day (1/21), Presidents Day (2/18), Spring Break 3/11-3/16) Schedules are typically posted within two weeks of the holiday period. The one-way trip between the campuses on the Vern Express typically takes 10-13 minutes. (*)When operating on a 15 minute schedule, there will be one Vern Express shuttle departing from both Foggy Bottom and Mount Vernon Campus at: 00, :15 , :30, and :45 past the hour. 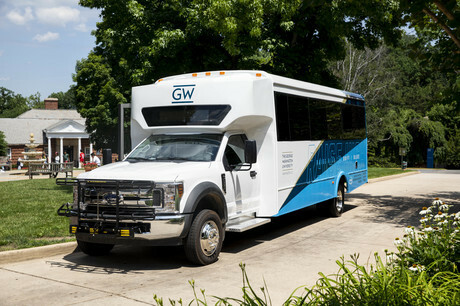 (**) When operating on a 30 minute schedule, there will be one Vern Express shuttle departing from both Foggy Bottom and Mount Vernon Campus at: 00 and :30 past the hour. During heavy traffic conditions, especially on weekdays from 7am to 10am and 3pm to 7pm during rush hour, the one-way trip may take longer. Passengers are encouraged to plan accordingly. For most up-to-date information regarding the Vern Express please use the TrasnLoc app or access the TransLoc information through the GW App. Lost and Found: Contact GWPD's Lost and Found at 202-994-6948 or visit Rome Hall, Suite 101. Learn more about the TransLoc Vex App!